This page describes how animations are used in the Corgi Engine. The Corgi Engine includes a lot of demo characters, and they all come with a number of animations. In the various demos, you’ll find some characters animated using spritesheets, some using Mecanim, Spine, or 3D fbx animated models. It’s really up to you to choose the animation method that fits your skills and needs. But the Engine should have you covered whatever method you decide on. Also note that most character animators in the engine will use an “any state” pattern for demo purposes only. Of course you’ll probably want to use more traditional patterns for your own characters, like you would in any Unity project. This page won’t cover how to create your animations. Unity has a lot of documentation on that, go check it out. It will however cover the specifics of the Corgi Engine and how it’ll help you create nice animated characters. In most cases you’ll need an Animation Controller to setup your animations. The asset includes a bunch of these, I’d recommend using the RectangleAnimator one as a starting point for yours as it includes all animation parameters, so you won’t have to enter them all again. You can simply duplicate it, and then drag your animations into it, replacing the Rectangle ones as you go. The Animation Controller is made of two big parts : on one side Animation Parameters that will get updated every frame by the Character and Character Abilities scripts to reflect the current state of the character, and on the other a state machine that will allow you to determine in which conditions each animation should be played and how to transition from one to the other. You’ll notice it’s very simple in terms of workflow, as most transitions are simply based on the current character’s state, so the hard work of checking the many possible conditions is already done by the engine. Of course you can divert from that and have more complex transitions if that works better for you. InitializeAnimatorParameters : This method “registers” parameters, for later use. Basically it just adds that parameter to a list, after having checked its existence in the Animation Controller, to avoid potential errors at runtime. If that parameter doesn’t exist, update requests will simply do nothing, without triggering errors. This allows you to share a single animator amongst many characters, without having to copy all parameters into all the controllers. This method is only called at Initialization. 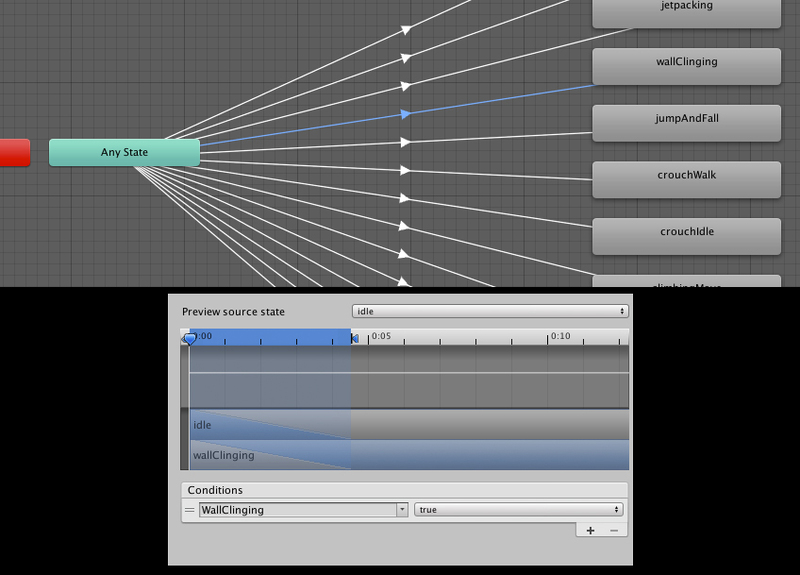 UpdateAnimator : This method, called every frame, will update the animator parameters with their current value. In it you should only have calls to MMAnimator.UpdateAnimatorBool/Int/Trigger. To add a new animation, all you have to do is create it, drag it into your character’s animation controller, and create a transition to it. If it requires new animation parameters, make sure you add them both to your animation controller’s parameters list and register/update them in your script(s) using the above methods. In addition to that, you’ll find a number of animation parameters in CharacterHandleWeapon whose name you can set from the inspector of each weapon directly. You can “bake” your character via the Spine Unity runtime. All the demo playable characters included in the asset use this method, but I wouldn’t recommend it for your game. The demo characters are baked because that was the only way to include them without having to add the Spine runtimes. These can’t be distributed by anyone else but Spine, so that was not possible. But baking Spine characters prevents you from using all the cool Spine features. The “best” way to do is to create/animate your character in Spine, then do File > Export, select .json extension and format, check “create atlas”, go to parameters, set the atlas extension to .atlas.txt, tweak the other settings according to your character, and then export to a folder inside your project. This will create a bunch of Spine related files. You’ll then want to select the SkeletonData file, and drag it into a scene. Select the SkeletonAnimator option, and you should see your character on the scene. If that’s not the case, you probably need to select a skin from that new object’s inspector. While you’re at it, select the sorting layer of your choice (Player is the recommended one). 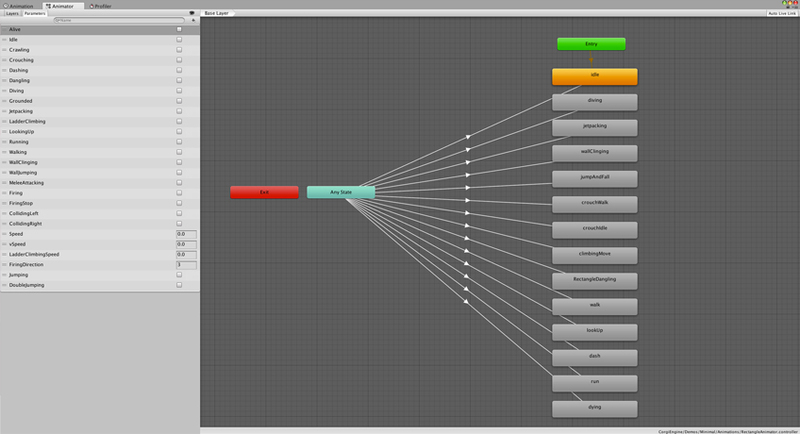 You can now drag that object into your hierarchy to create a prefab. Now there are two things left to do : add your Character’s components (see this page for more), and take care of the animator. Spine animators work exactly like regular ones. Select your Character, and go to Window > Animator. There you should see an empty state machine. Start by adding the animation parameters you’ll need from the list above (Idle, Crawling, Crouching, etc…). Then, from the folder with all the exported Spine files, unfold the Controller animator, and drag and drop the required animations into your Animator. The only thing left to do is to create transitions to all these states, and that’s done exactly like for regular animation controllers (see higher in this page). Two more things : you should nest your Spine object under the top level of your character (which should be an empty gameobject with just the colliders, CorgiController, Character and CharacterAbilities…). You can look at the NativeSpineCorgi example character for reference, located in Demos/Corgi2D/Spine/NativeSpineCorgi.